This 360 degree new design mop is perfect for door,kitchen,bathroom,lobby,bedroom,etc.It mop pad has super thin microfiber with great absorbent ability,which can effectively remove fouling and do fully cleaning without damaging floors. ♥When not in use, it should be stored off the ground and the tractor should be fully drooping. ♥After the yarn is used up, it should be cleaned with a neutral detergent, dried, and placed in a ventilated place, which can extend its service life exponentially. Please contact us for the first time if you have questions or comments, we will reply you.If for any reason you are not fully satisfied, just return it and we will give you a full refund. High absorbency: This cotton string is made of thick cotton yarn for better water absorption. High absorbency means your floors dry quicker! And it also has better decontamination ability. hangable hole for easy storage Bite knob: Our wet mops use a unique bite knob that allows you to change the mop head yourself without having to change the handle, so our mops are more economical and durable. Replaceable mop head: Our products include 2 free cotton yarn mop heads that you can change at will. And improves cotton yarn mop heads cleaning performance and reusability. Applicability: Professional quality, great for cleaning the home or office. 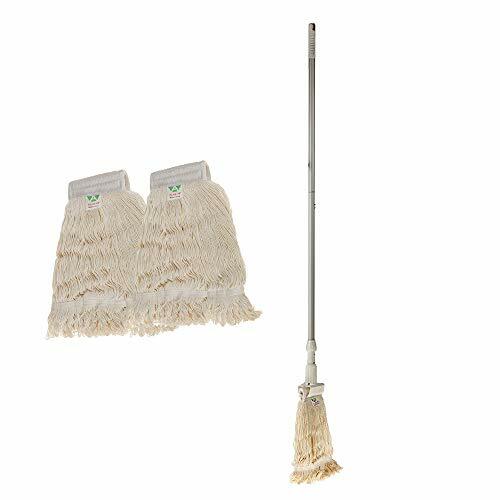 You can also use this floor mop to clean all types of surface areas including home floors, kitchens, restaurants, bathrooms, garages, warehouses, offices, decks and much more. If you have any questions about this product by KLHB-YF, contact us by completing and submitting the form below. If you are looking for a specif part number, please include it with your message.